Sigma Kappa shows off their South African Safari float. Sigma Kappa placed first in the parade. ASU’s 2017 Homecoming Weekend kicked off on Oct. 27 in the Junell Center with a Pep Rally. The ASU cheerleaders and Angelettes pumped up the audience, performing routines to "Uptown Funk," "Happy," and "Fat Bottomed Girls" courtesy of the Ram Band. Step Show Finals also took place with Kappa Delta Rho taking first place. The 2017 Homecoming theme was "ASU Around the World." Each organization chose a country to represent it in the homecoming contests. Tri-Beta, the biology national honor society, won first place with its Australian-themed sign in the Run-Through Sign Contest. Rams for Christ, chose the country of Iceland, came in second place. "We spent a couple of weeks building the bonfire," Cadet Casey Lockett said. "We had a lot of student organizations come out and help; a lot of fraternities, sororities, and the College of Business." ROTC oversees the bonfire every year. "We run it and light it, and afterwards we stay until 7 a.m. to make sure it doesn’t catch anything on fire," Lockett said. 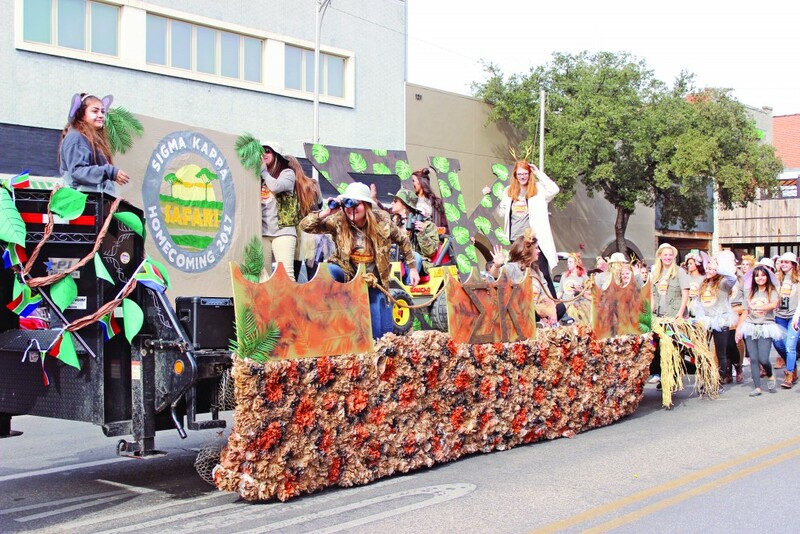 The homecoming parade took place Saturday morning in downtown San Angelo. Spectators lined the streets to cheer on the Rams and collect free candy. Following the homecoming theme each organization used its chosen country to inspire its float’s decoration. Sigma Kappa won the contest with its Africa float. "We did a lot of hard work. All of girls pitched in and made poofs to make our float look fabulous," Sigma Kappa Panhellenic Delegate Madelyn Day said. Lambda Chi Alpha took second place with its China-themed float, complete with a Chinese dragon and drums. In third place was the Association of Mexican-American Students with a colorful Mexico float. Manny Campos, political science professor, performed at Ram Jam. A local group called Funky Munky also played. The Rams finished the game with a decisive victory of 44-7, providing an excellent end to homecoming weekend. "The homecoming crowd brought out a lot of good energy and I think we played off that and picked up some momentum from it," long snapper Jonathan Letter said. Nick Ellis and Claire Parker won homecoming king and queen.